By yearend 2017, the United States prison population had declined by 7.3% since reaching its peak level in 2009, according to new data released by the Department of Justice. Dorothy Gaines's life changed when Alabama state police raided her home for drugs. Police found no evidence of Gaines having possessed or sold drugs, yet federal prosecutors charged Gaines with drug conspiracy. Although arrests of boys in Washington, DC have declined in the last decade, arrests of girls have increased. In 1999, Theresa Smith was arrested at an airport after she met a drug courier in Roy Mercer’s network and according to the government, identified a suitcase containing eleven kilograms of cocaine for the courier. Smith said she had been told by Mercer that the suitcase contained his nieces’ clothes. For this first-time non-violent offense, Smith was sentenced to a ten-year mandatory prison term. Homicides involving white victims are significantly more likely to be "cleared" by the arrest of a suspect than homicides involving victims of color, causing racial disparities in capital sentencing to begin as early as police investigations. Learn more in Race & Justice News. As awareness around state violence towards people of color grows, several churches decide to stop calling the police to protect communities of color. A church in Oakland is instead investing in de-escalation trainings to handle situations without calling the police. At 24 years old, Kemba Smith was sentenced to 24.5 years in prison for conspiracy to participate in her boyfriend's drug activities, a non-violent, first-time offense. For years, her parents galvanized a tireless movement seeking clemency for their daughter. The Sentencing Project's key fact sheet provides a compilation of major developments in the criminal justice system over the past several decades. Over the past quarter century, there has been a profound change in the involvement of women within the criminal justice system. 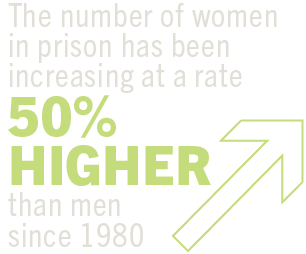 This is the result of more expansive law enforcement efforts, stiffer drug sentencing laws, and post-conviction barriers to reentry that uniquely affect women. In honor of Mother's Day, we are celebrating leading advocates who are giving voice to the unique issues and concerns facing incarcerated and formerly incarcerated women and girls. Coalitions in Maryland, Mississippi, and Kentucky mobilized to counter regressive sentencing measures by promoting solutions addressing underlying causes of crime.